A new trail running race is set to launch through the vineyards of the Italian Riviera this March. The 47km trail is ideal for those with a good level of fitness looking for a new challenge in a stunning setting. 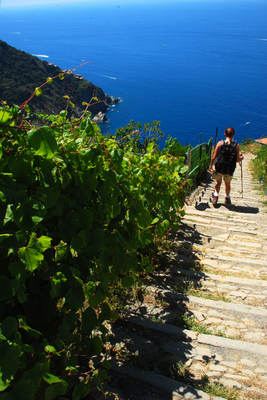 Named SciaccheTrail, after the local Sciacchetrà wine, the route winds through the centuries old vineyards of the Cinque Terre National Park, with panoramic sea views and beautiful scenery. The race takes place on 29th March 2015 and will be an annual event. The entry fee is £30. The SciaccheTrail stretches from the coastline and up into the Ligurian hills. Highlights include passing terraced vineyards, wineries where Sciacchetrà is made and the picturesque and colourful UNESCO World Heritage Cinque Terre villages. The trail race will kick off on 28th March 2015 with a celebratory SciaccheTrail Festival, where there will be music, wine tastings with local sommeliers and a kids race. Friendly hotel, Hotel Degli Amici, in the old town is ideal for competitors. Located in front of an olive grove, there is a roof terrace with sea views- perfect for relaxing on after the race. The hotel's restaurant serves typical Ligurian dishes. Overnight stays costs from £42 per room per night. Flights from London Stansted to Genoa with Ryanair (ryanair.com) start from £80 return and flights from Gatwick to Genoa with British Airways (britishairways.com) start from £89 return. Monterosso is then an hour and a half drive or one hour twenty minute train ride from Genoa. For further information on “in Liguria”, visit turismoinliguria.it.